Campaign celebrating the significant milestones achieved by family firms around the world is launched. 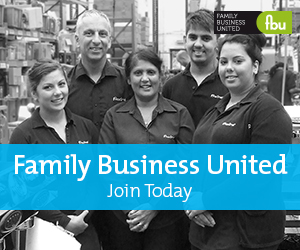 Family Business United ('FBU') is proud to announce a new campaign for 2019 that celebrates those family firms that have hit a milestone in their evolution, a key date in the development of the family firm that is worthy of celebration. Family Business Milestones is a new campaign that will promote and celebrate those families in business that have hit a significant date - be it 10, 20, 50, 75, 100, 125, 150 or 200 years (or another key date) and are happy to share the good news. As Paul Andrews, founder of FBU explains, "Family firms with a story to tell have a great message to share and storytelling is increasingly becoming a key differentiator when it comes to marketing too. Family firms with history and heritage have been proven to generate more respect and trust and consumers like the fact that they are in business for the long term and that many have been around for generations too. Celebrating the family business community through this new campaign will continue to highlight the immense contribution that family firms make to the global economy and we are delighted to be championing their cause in this way." Family firms that have a key date to celebrate in 2019 are invited to get in touch via email in the first instance (paul@familybusinessunited.co.uk) so that we can then follow up and gain an overall insight into the business and some key quotes for a feature piece that we will then include on our award winning magazine and share more broadly on social media too. As Paul concludes, "FBU is all about the family business and we are looking forward to hearing from more businesses around the world to feature and include in the campaign. This is yet another innnovative approach to the family business sector that will undoubtedly help to put even more family firms in the spotlight and help us add to the positive voice surrounding the great contribution that these firms make." Follow the campaign on social media using the hashtag #FamilyBusinessMilestones.